Montana turned two first-quarter turnovers into an early 17-0 lead and never trailed in picking up a 48-28 victory over Cal Poly on Saturday evening at San Luis Obispo. The Grizzlies improved to 4-1, 2-0 in league, and won at Alex G. Spanos Stadium for the first time since 2008, snapping a three-game losing streak on the Mustangs’ home field. “It was a great effort and a great, great win by our guys. It’s been a while since the Montana Grizzlies beat (coach) Tim Walsh’s Cal Poly Mustangs,” said coach Bobby Hauck. With a nod to Cal Poly’s triple-option offense and wanting to make the Mustangs play from behind, if possible, Montana elected to receive the opening kickoff after winning the coin toss. The Grizzlies grabbed a 3-0 lead on a Tim Semenza field goal before the game was four minutes old and got the ball back when Dante Olson stopped Joe Protheroe for no gain on a 4th-and-1 attempt on Cal Poly’s first possession. It was the first of Olson’s 24 tackles. Montana stalled out on offense and was forced to punt, which led to the first key turnover of the quarter, a fumble on the punt return that gave the Grizzlies a first-and-goal. Two plays later, Dalton Sneed found Gabe Sulser for a six-yard touchdown, and Montana led 10-0. Cal Poly answered the way Cal Poly answers, rushing 12 times and passing once on a drive that moved the Mustangs inside the Montana 20. But an option pitch was fumbled and picked up by Josh Buss, who motored 80 yards for a 17-0 lead. And Montana had just the start it needed. “Turning the ball over is a big deal, especially against these guys,” said Hauck. “They have the ability to move the chains, and when they don’t make mistakes, they are difficult to stop. 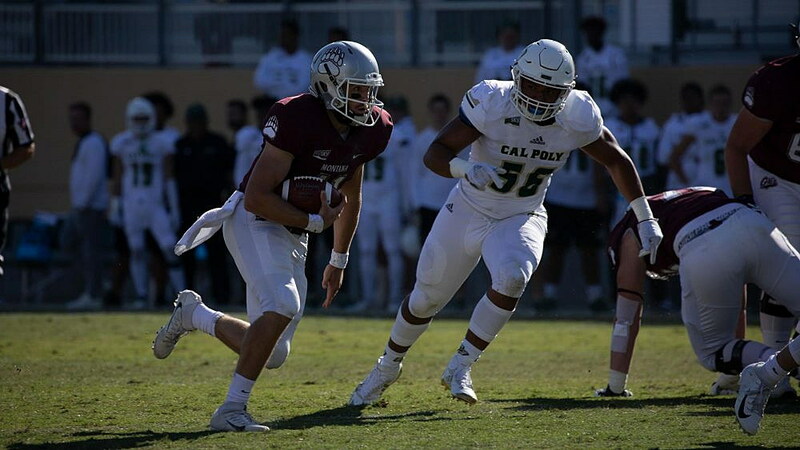 Cal Poly would get on the scoreboard early in the second quarter, but Montana answered with a pair of Sneed touchdown passes, first to Samuel Akem for 54 yards, then to Matt Rensvold for eight, and the Grizzlies led 31-7 at the half. Hauck would have no trouble keeping his players’ attention at halftime, not when earlier this month his team led Northern Iowa 26-0 at the half and had to hold on to the very end. “We came out and reminded them we were up 26 the first week of the year and ended up in a barnburner and fighting our tail off,” said Hauck. Adam Eastwood scored on a 14-yard run in the third quarter to make it 38-14 and ran untouched up the middle for a 68-yard score early in the fourth to extend Montana’s lead to 48-21. It was part of a 132-yard rushing performance for Eastwood and a 183-yard day on the ground for the Grizzlies, who also totaled 285 yards through the air. “Our guys did a good job up front. They cleaned it up for everyone else, whether it was the wide receivers or running backs or Dalton,” said Hauck. Sneed accounted for all of Montana’s passing yards, going 23 for 32 and three touchdowns. One week after rushing 16 times for 206 yards against Sacramento State, he was mostly kept out of harm’s way. He carried it just four times for 26 yards. “We tried to limit some of the run game so he didn’t carry it as much as he has the last couple of weeks. I thought he was sharp. He played pretty well tonight,” said Hauck, who directed the praise for Montana’s play-calling to the team’s offensive assistants, led by coordinator Timm Rosenbach. Cal Poly would generate 32 first downs, 14 more than Montana, and run 95 plays for 512 total yards of offense, but none of it came while holding the lead, thanks to the Grizzlies’ fast start. And on this day, that was everything. Montana will host Portland State (1-4, 0-2 BSC) next Saturday at 2 p.m. at Washington-Grizzly Stadium for Homecoming.